Not too long ago, a new place called Burger Lounge made its way into Beverly Hills. Well, new is a relative term, as the place has been hanging out in San Diego for years. As with all intriguing burgers, I knew I had to test out it and recruited my buddy from San Diego to accompany me. He had frequented the lounge down in SD back in the day and I thought he would be helpful in my quest. I immediately realized he was a good choice, as he started recommending various things on the menu. Of course, there was only one thing I was really after – the Lounge Burger. Yet, I followed his lead by ordering a Mini Vanilla shake and splitting the Half and Half onion rings and fries. But before I get down into food details, I first need to mention that nothing about the place was “loungey.” In fact, it looked like just about every other fast-casual restaurant I had ever been to. But I was not there for the decor. I was there for food and drink. 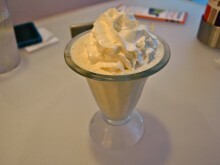 The drink part, my vanilla milkshake came first and was quite tasty. I hadn’t had a shake in a while and this was a pretty good one. My only gripe, though, is that it came out way too quickly. Even drinking conservatively I finished it long before my burger arrived. When it did arrive it looked quite awesome. I had ordered it without its onions, lettuce and tomato, then opted for white cheddar as my cheese (it was either that or “organic American”). It also came with house-made 1000 Island dressing. One thing that did not look awesome was the cheese, which was clearly not white. Yet, for its part the American cheese was better than I expected. 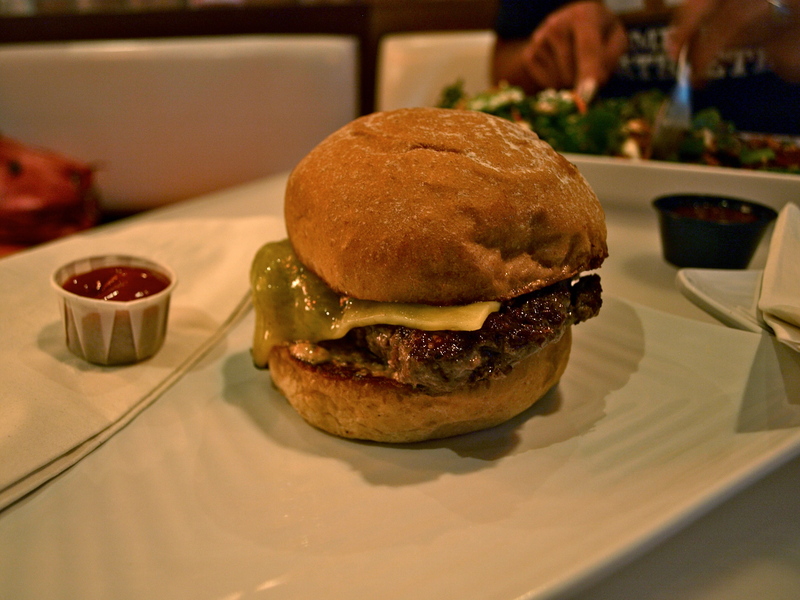 The burger had a pretty thick grind and hand-shaped feel that I didn’t expect and was cooked really nicely. The outside was slightly crisp and charred, while the inside was nearly a medium-rare. I say nearly because half the burger (like one side of it) got deep pink, while the other side was at a relative medium. I don’t know how they did it, but it was better than expected. And the bun was pretty perfect, holding together strong when the burger got juicy without interfering with the flavors. 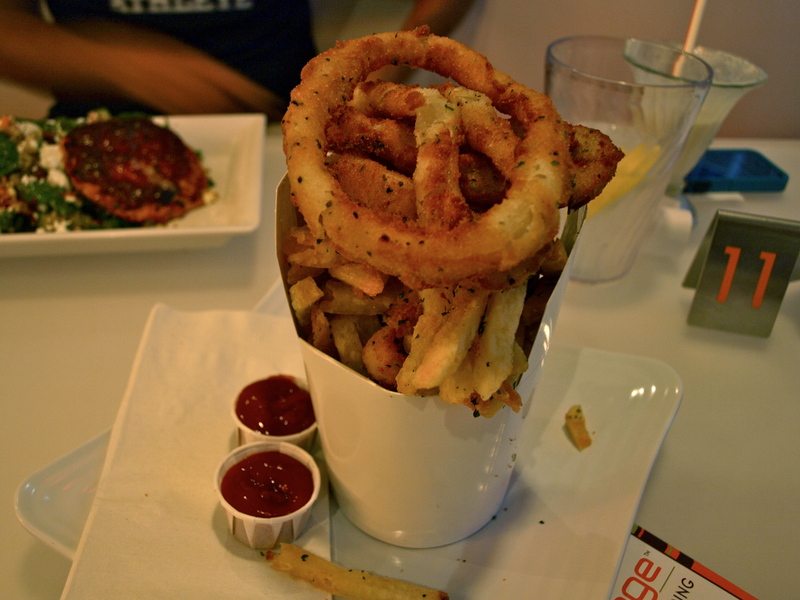 Yes, I would like fries with my rings. The Half and Half turned out to be a great choice, despite coming in a strange conic container preventing us from digging for onion rings. Ultimately, we had to pour out the contents onto the plate that came with them. Burger Lounge is supposedly “Certified Green,” but this egregious waste of paper really made me wonder. Nonetheless, the seasoning in the onion ring batter and on the fries were great. It wasn’t your average seasoning salt, but something more complex and more worthwhile. Yet, I have to say I was disappointed by how stubby the fries were. It was like we got the remains at the bottom of the bag, because finding an inch-long fry required a whole lot of digging. In the fast-casual landscape Burger Lounge scored some winning marks. They definitely had a few kinks to work out, but are likely safe in their realm of burgers.